By the mid 1980’s Ginetta were looking to return to their glory days of the G15 in terms of volume and they developed a mid engined vehicle known as the G32 and invested in type approval so that the car could be sold as a turn key model. The Walketts even sold out to a team led by Martin Phaff and Mike Modiri with Ivor Walkett remaining as Technical Director to secure the companies future in 1989. The G32 was scheduled to be launched at the 1990 British International Motor Show at the NEC in Birmingham. 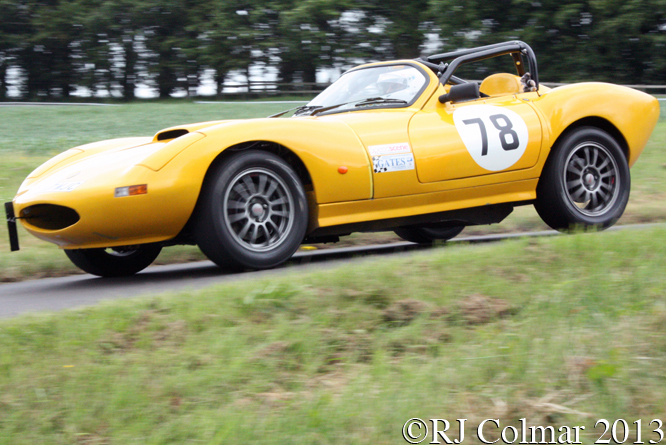 A couple of months earlier Mark Warklett and Noel Palmer, a former TVR employee, were eating pizza in a restaurant when they hatched a plan to fit a ubiquitous all aluminium Rover 3.9 litre / 240 cui V8 developed from the 1960’s Buick 215 V8, into a 4 cylinder Ginetta G27, sketching out the idea on a napkin. 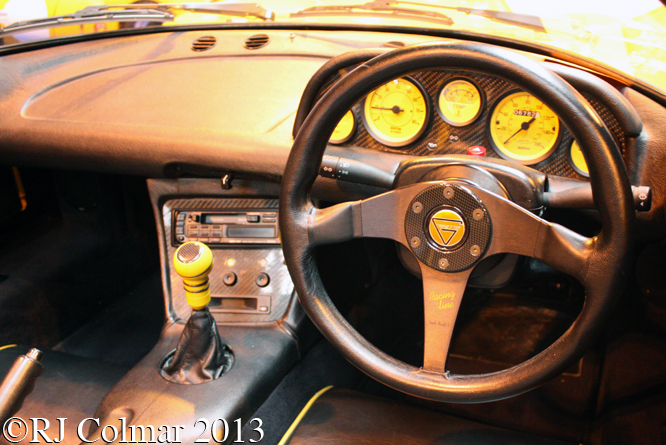 While preparing the G32 for it’s launch Ginetta managed to find the time to squeeze a Rover V8 into a G27 which became the prototype G33 that appeared next to the G32 on Ginetta’s stand at the 1990 International Motor Show. The Prototype G33 was tested by Tiff Needell on Top Gear and before they new what was happening Ginetta received a flood of enquiries about the G33 which could reach 60 mph from rest in 5 seconds and had a top speed of 150 mph from it’s standard Rover V8 which produced 205 hp. To meet the unexpected demand Ginetta rushed the G33 into production with a steel space frame chassis and fibre glass body that was wider than the G27 to accommodate the V8. Not having the resources to get the car type approved the G33 was sold in virtually complete form, as was possible in those days, with instructions on how to finish the car off for the same price as a modest performance saloon/sedan. It is thought 90 G33s were built, many with subtle differences due to the lack of time to develop the model properly, up until 1993 when the company had to be rescued from financial difficulties with insufficient resources to continue production of the G33. A prototype 4 cylinder Ford Cosworth powered example of the G33 was built but the car was stolen from the factory before it was developed. To raise cash the rights to manufacture along with the G33 moulds were sold to a Swedish concern called Gin 1, pronounced Gin Ettain Swedish who manufactured the renamed G34 with a turbocharged 2 litre Volvo motor taken from the 900 Series. 16 Gin 1s were manufactured before they folded with the manufacturing rights and moulds returning to Ginetta who based their 1998 40th Anniversary G40 model on the G33. The #78 seen at Gurston Down is being driven by Graham Beale and according to the programme is fitted with a 1993 cc turbo charged motor, possibly a Ford YB RS Cosworth motor. Thanks for joining me on this “Another Napkin Job” edition of “Gettin’ a li’l psycho on tyres” I hope you will join me again tomorrow when I’ll be looking at the very last complete car to leave the Bristol factory. Don’t forget to come back now ! 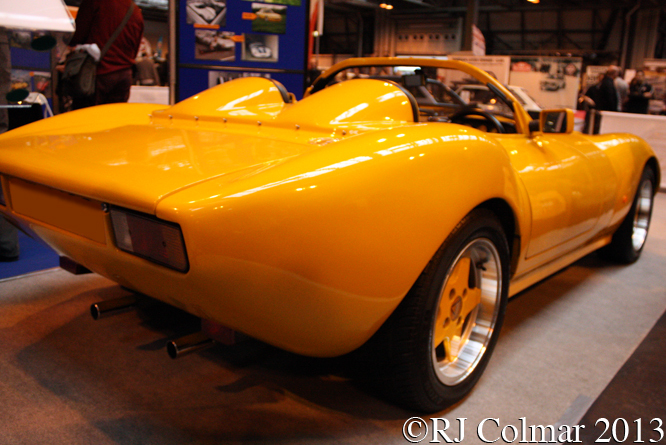 This entry was posted in Uncategorized and tagged Beale, Birmingham, Buick, Classic Motor Show, Colmar, Ford Cosworth, G27, G33, G34, G40, GALPOT, Gin 1, Ginetta, Gurston Down, Modiri, NEC, Needell, Palmer, Phaff, Ralph, Rover, Volvo, Walkett on February 22, 2014 by Ralph.